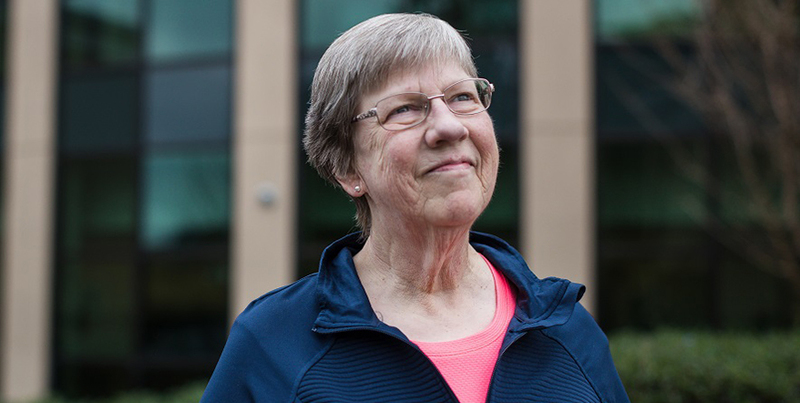 For Lynette Nielsen, the diagnosis of non-small cell lung cancer started a 6-month journey that included a combination of chemotherapy and radiation. As of today, Lynette has been cancer free for just over a year. She credits the medical professionals at the Community Cancer Center in Roseburg. But it’s obvious that the credit should also go to her tireless spirit and can-do attitude, which she replenishes every week at her favorite credit union. “I call them my family,” Lynette said about her visits to the Northwest Community Credit Union North Roseburg branch. While the folks at the branch do enjoy Lynette’s visits and wish her all the best with every interaction, one of the biggest reasons for her improved health has been her drive to quit smoking. Lynette has been a caregiver and domestic engineer for well over 30 years. She got her start in the Portland area. But when her mom got sick, Lynette dropped everything to help her mother. Today, she’s cleaning homes and providing care for a handful of clients throughout the Roseburg community. She’s also walking as much as she can every day. Lynette also participates in a special program at the area YMCA in collaboration with the Knight Cancer Institute. She and a dozen other cancer survivors exercise together two nights a week. As she continues to improve her health, she’s always thinking ahead to her next cancer checkup. For now, Lynette is happy taking her 1-mile walk around the hospital, exercising at the YMCA, visiting the credit union every Friday, and providing top-notch home care for those who need it. At Northwest Community Credit Union, we applaud uncommon members like Lynette. Not only do we enjoy seeing her every time she comes by the credit union, but it’s our pleasure to help with all of her finances, including cashing checks, saving for the future, and helping her keep track of her checking balance. We’re here for you, too. Stop by your favorite, local branch and see why Lynette and others applaud our uncommon service and member focus.